Administrators have the ability to set plain text or HTML as the default format in the Notes field in Calendar items. The ability to change the format of the Notes field was added in an update, with the default format set to HTML, but the default can be changed to Plain Text, RTF, or HTML by editing the registry. With the default set to HTML, dragging messages to the Calendar to insert as a shortcut will appear to create a blank message. This is because HTML doesn't support embedded objects. To make the shortcut visible, change the format on the appointment item to Rich Text (on the Format text tab). If you frequently do this, change the default format to RTF. 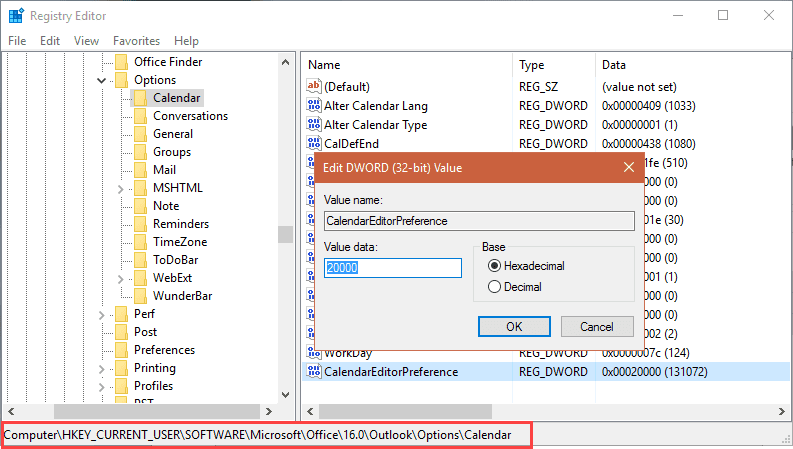 This will not affect the ability to change the format in any appointment or meeting, it only sets the default format for new Calendar items. Right-click on the calendar key and choose New > DWORD. Type or paste CalendarEditorPreference as the DWORD name then press Enter. Right-click on CalendarEditorPreference, and choose Modify. In the Value data box, type one of the following values (as Hexadecimal) and click OK.
Close the registry editor and restart Outlook for the setting to take effect. I tried this both manually and via the reg file on a few different PCs but my default remains at Rich Text when I drag a HTML formatted email to the calendar. The default format for Outlook is set to HTML. Has anyone had luck with this? The function used it embed the message body in the appointments defaults to RTF and it can't be changed. Inserting the message as attachment or as a shortcut uses a different function will use HTML if it is your default. I use the method at https://www.slipstick.com/developer/code-samples/create-outlook-appointment-from-message/ to create an appointment from the message body (second macro on page).